It’s time to Kick It with Liverpool FC! Do you think you have what it takes to score a goal against your favorite Liverpool FC goalie? Want a chance to see Liverpool FC host Manchester United FC at Anfield stadium in Liverpool, England? 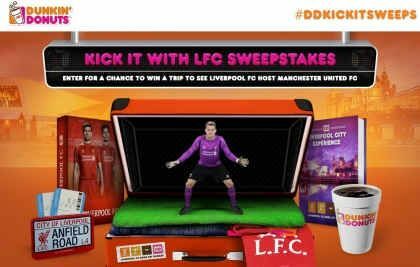 Dunkin’ Donuts and LFC are giving you a shot with the Kick It with LFC Sweepstakes! For this national sweepstakes, Dunkin’ and Liverpool FC fans can visit the contest website (www.ddlfcsweeps.com) to enter for the chance to win a trip for two to see Liverpool FC face Manchester United FC at Anfield. You have from now until November 10th to enter, and you can enter once a day. One lucky fan will score the grand prize, which includes two tickets to see Liverpool FC play against Manchester United FC at Anfield. The winner and their guest will receive roundtrip airfare, hotel accommodations for two nights, as well as spending money for the visit. There’s no purchase necessary for this contest and you just need to be 18+ and a legal resident of the U.S. to enter. For complete rules and additional information, visit www.ddlfcsweeps.com. 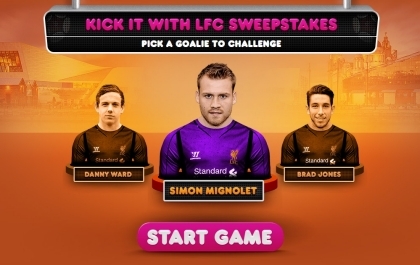 This sweepstakes website also gives soccer fans a chance to challenge their favorite Liverpool FC goalies, including Simon Mignolet, Brad Jones and Danny Ward, to a shootout. After playing, fans can share their scores with friends on Facebook and Twitter. Need some coaching on how to play the game? Head over to http://dun.kn/1rL4HJn for some tips from Liverpool FC goalie Simon Mignolet.